Gov. Doug Ducey’s budget proposal released today show more funds for school repairs, counselors, career education and scholarships for community college and university students who promise to teach in AZ schools to ease the teacher shortage. “The governor said in his State of the State address on Monday, that his budget will fully fund the priorities that we know are important – the things that matter – public safety, child safety, education above and beyond inflation,” said Matt Gress, director of strategic planning and budgeting for the Governor’s Office. a small investment of state funds to prevent another freeze on KidsCare and putting new federal child care dollars to work right now to raise scholarship rates! 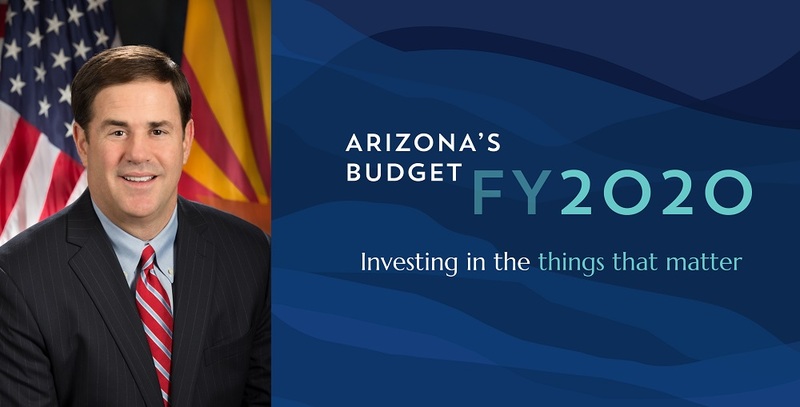 “In fact, we are making a historic investment into the state’s rainy day fund, preserving Arizona’s fiscal future, ready to take on whatever unexpected economic event might happen, so that we can recover faster, stronger than ever before,” Gress said. Fifty percent of all the governor’s initiatives and 70 percent of all new spending in fiscal year 2020 is dedicated to K-12 education and higher education, said Sarah Giles, budget analyst for the governor’s office of strategic planning and budgeting. “We look forward to working with Governor Ducey and other state leaders to tackle the investment priorities outlined in the Roadmap for P-20 Education Funding in order to reach the Arizona Education Progress Meter goals and ensure every student receives an excellent education every step of the way,” Thompson said. Sarah Giles, budget analyst for the governor’s office of strategic planning and budgeting, shares details of the governor’s FY 202 budget plan for education. Photo courtesy Office of the Arizona Governor. The governor’s budget proposal includes an ongoing commitment to raise teacher salaries by 20 percent by 2020 and continuing to phase the partial restoration of additional assistance, Giles said. “The fiscal year 2020 budget includes an additional $165 million for teacher salaries in the baseline (funding), which means that this funding is permanent and will be adjusted annually for inflation,” Giles said. Budget analyst Sarah Giles outlines details of the education portion of the governor’s budget proposal. Last year, voters sent a clear message to leaders to do something about the teacher shortage, per-pupil spending among the lowest in the nation, and schools in need of vital repairs, said Kathy Hoffman, Arizona Superintendent of Public Instruction. The fiscal 2019 budget established a five-year plan to restore $372 million suspended from basic state aid for additional assistance to Arizona’s K-12 public schools, and the Governor’s budget proposal includes the second installment of $68 million in fiscal year 2020, Giles said. Additional assistance is flexible funding that can be used outside of typical maintenance and operation costs on things like textbooks, curriculum or technology. 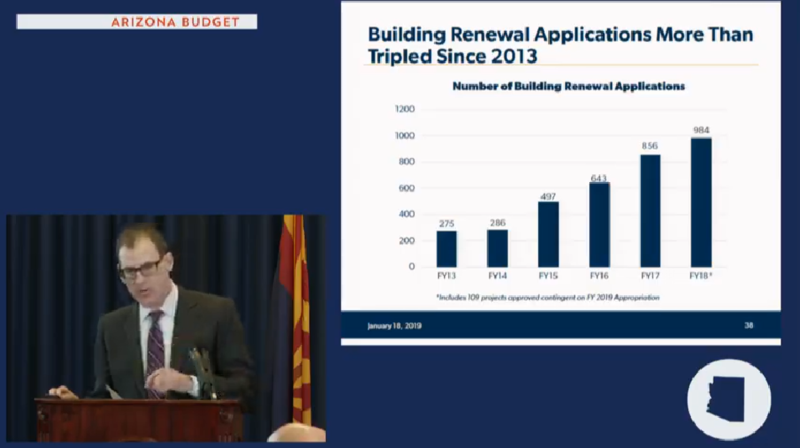 “At full implementation, the cumulative impact of these initiatives is over $1 billion in additional and permanent funding for education,” Giles said.
.@dougducey FY20 Executive budget proposal out today funds second portion of teacher pay/DAA plan, includes $28M increase in building renewal to nearly $80M, provides nearly $100M in new school construction money. Full summary of education provisions coming soon. 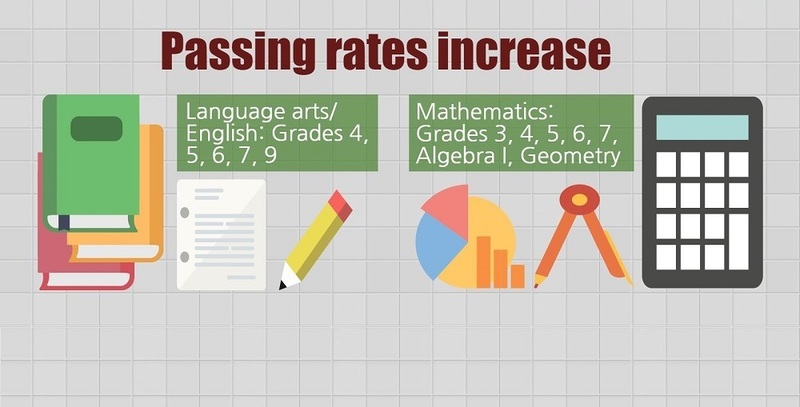 Results-based funding was first introduced in fiscal year 2018 to reward schools for high student achievement and to encourage replication and expansion of high performing schools. 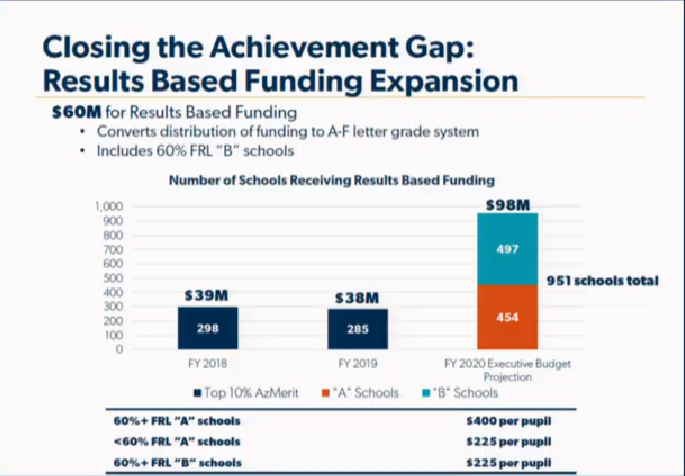 Schools that receive an A letter grade will qualify for results-based funding under the current formula, but schools with B letter grades and also have 60 percent or higher free- and reduced-lunch participation and a $60 million increase in funding would support this expansion, Giles said. “We are fortunate the Governor recognizes the great gains happening in Arizona classrooms. 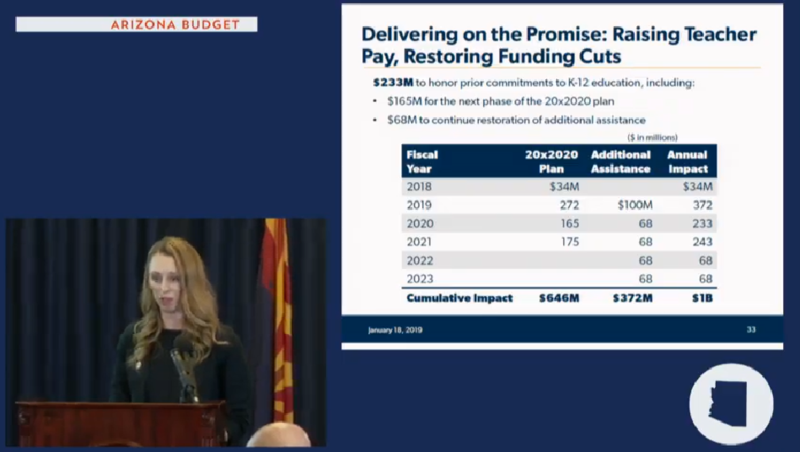 This proposed budget increases opportunities for students in low-income neighborhoods with the expansion of Results-Based Funding for low-income ‘B’-rated schools,” said Emily Anne Gullickson, executive director of A for Arizona. “Closing the achievement gap is a goal we all share. This funding makes it possible for excellent schools to reach more students in poverty, with transformative effects for more families and communities,” Gullickson said. 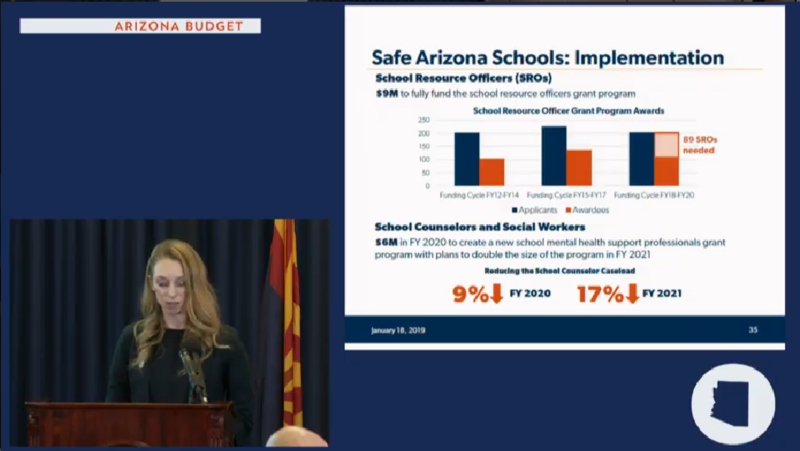 The Safe Arizona Schools plan released in March 2018 would invest more in mental and behavioral health resources as well as increasing the number of school resource officers on campus, Giles said. Thank you @dougducey for including #schoolcounselors in your budget. “School counselors know their students individually, build relationships with them, and are able to notice subtle, gradual, or dramatic behavior changes.” Thank you for recognizing the importance of our role. “As a result of this investment, we estimate that school counselor case loads could decrease by up to 17 percent,” Giles said. 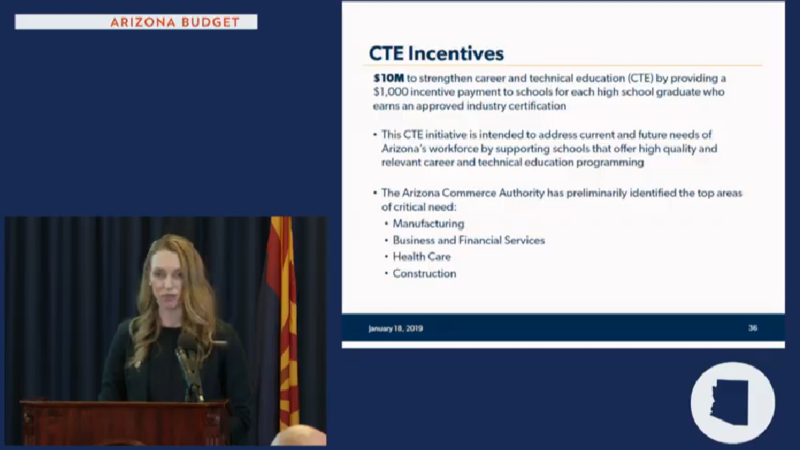 The governor’s budget proposal includes $10 million to develop a career and technical education incentive program, further aligning Arizona’s K-12 education with growing workforce needs, Giles said. Sara Giles outlines the details of the proposed expansion of career and technical education funding. So far the Arizona Commerce Authority has indicated that these critical areas include manufacturing, business and financial services, construction and healthcare. 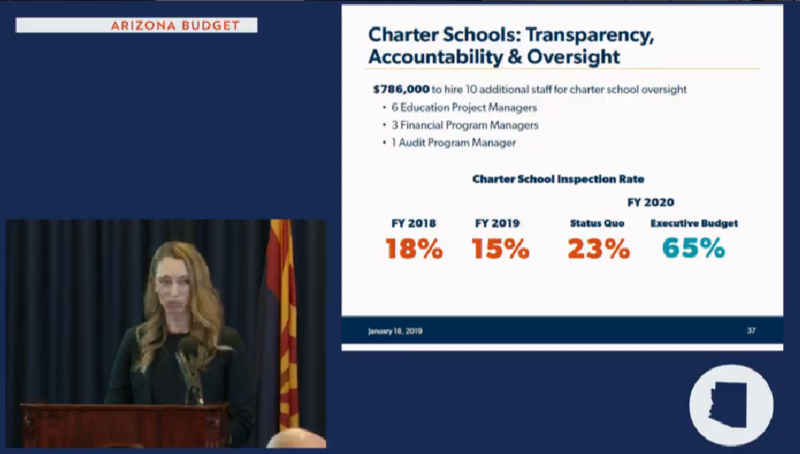 The Arizona State Board for Charter Schools grants charter status and oversees more than 500 charter schools statewide and almost 17 percent of Arizona students attend charter schools, Giles said. The governor’s budget proposal provides $786,000 to hire 10 additional staff members to conduct more frequent school site visits to address operational, academic and financial performance concerns. Sarah Giles outlines the charter schools initiative details. “The board is currently finalizing their financial performance framework that will be used to determine a new intervention process for schools that do not meet financial performance standards to include site visits and additional oversight of financial management practices,” Giles said. This additional funding means the board will be able to inspect 65 percent of charters compared to an estimated 23 percent under current staffing levels, Giles said. School building renewal requests have more than tripled since fiscal year 2013, said Bret Cloninger, assistant director of strategic planning and budgeting. Bret Cloninger, assistant director of strategic planning and budgeting, provides details about repair and new building requests to the school facilities board. These needs are driven in large part by aging school building systems, Cloninger said. “In the six years after the passage of Students First in 1998, the state completed $1.3 billion in emergency deficiency corrections projects, which were focused on bringing building systems up to square footage or structural quality standards,” Cloninger said. Also from 1999 to 2004, $934 million in new schools were completed, Cloninger said. “It’s now 15 closing on 20 years later and these school building systems, including expensive items such as roofs and HVAC systems are aging and many are now coming for significant repair or replacement,” Cloninger said. School building renewal requests for fiscal 2019 are approaching the fiscal 2019 appropriation which is $51 million. To meet school building renewal needs in fiscal year 2019 the governor’s budget plan adds $25 million, which brings the total for the year to $76 million, Cloninger said. 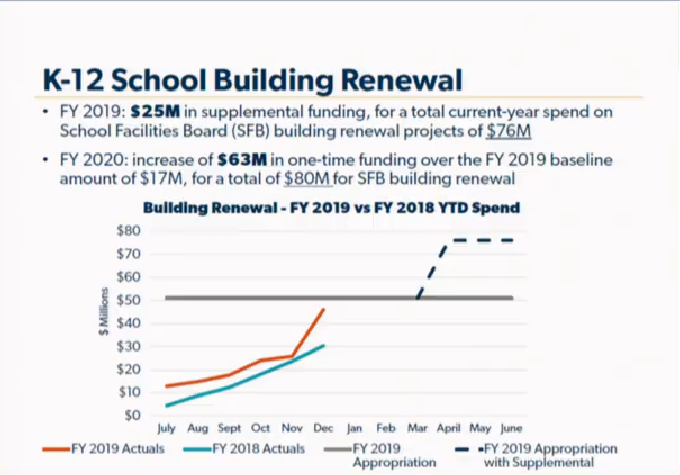 “To meet school building renewal needs in fiscal year 2020, the executive budget includes $63 million over the baseline building renewal amount of $17 million, which represents a total $80 million recommendation for building renewal in fiscal year 2020,” Cloninger said. In fiscal year 2013, the Arizona Legislature changed the standards for constructing new schools from constructing them if needed in three years to constructing them only if needed in the current year, Cloninger said. This meant overcrowded schools could have students in improvised space for as long as three years while a new school was being designed, appropriated and constructed, Cloninger said. The governor’s plan returns to constructing new schools if they will be needed in the next three years and estimates that the one-time amount needed to catch up will be $99 million on top of the current law’s need for $92 million for the construction of new or expanded schools, Cloninger said. The budget proposal also includes $104 million or 7 percent of all new funding in fiscal year 2020 for higher education, Giles said. Kwesi Pasley, a budget analyst with the Governor’s Office of Strategic Planning and Budgeting, presents details on University funding. In addition to $30 million to hold universities financially harmless for the health insurance trust fund increase, there’s also money for capital and operational expenditures as well as expanding the success of the Teachers Academy, Giles said. There’s additional funding for career and technical education at community colleges, Giles said. To address the critical teacher shortage that Arizona is facing and create more teachers quickly the Governor’s budget proposal includes $21 million to expand the Arizona Teachers Academy, said Kwesi Pasley, a budget analyst with the Governor’s Office of Strategic Planning and Budgeting. 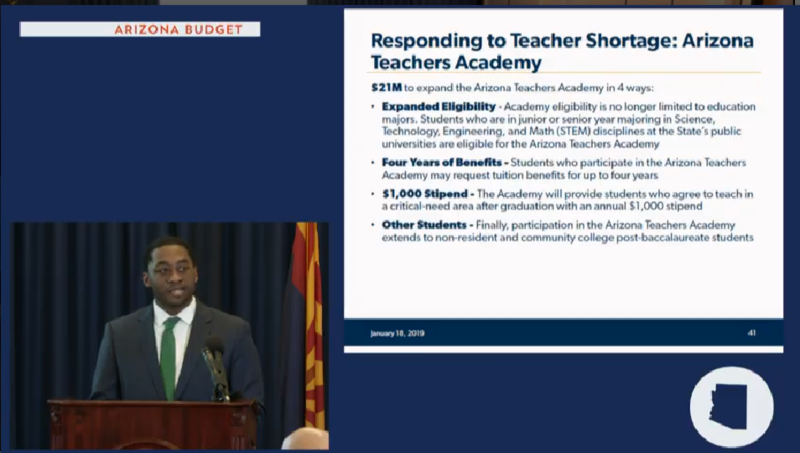 Kwesi Pasley, a budget analyst with the Governor’s Office of Strategic Planning and Budgeting, presents details on increasing funding for the Arizona Teachers Academy. In 2017, Gov. Ducey and the state’s three public universities launched the Arizona Teachers Academy to help students become teachers and work in Arizona schools to ease the teacher shortage. Through this investment, more than 3,400 university students and 1,100 community college students are expected to be able to participate, Pasley said. Gov. @dougducey‘s budget proposal includes expanding the Arizona Teachers Academy, providing education for thousands of students to become teachers in Arizona’s classrooms and lifts the financial burden of student loan debt. Community college provide ways to earn certification in-demand, high-end skills, Pasley said. In addition, the Maricopa County Community College District offers a number of healthcare training facilities in Maricopa County including the Center for Nursing Excellence at Phoenix College, the state’s $5.8 million investment will allow for MCCCD to create training programs for six new specialty areas including operating room, emergency care, telemetry, oncology, ICU and home care specialists, Pasley said. “With these areas expected to grow on average 24 percent according to the Bureau for Labor Statistics by 2024, this investment will ensure that enough health care professionals are being credentialed to meet the demands of this growing sector,” Pasley said. 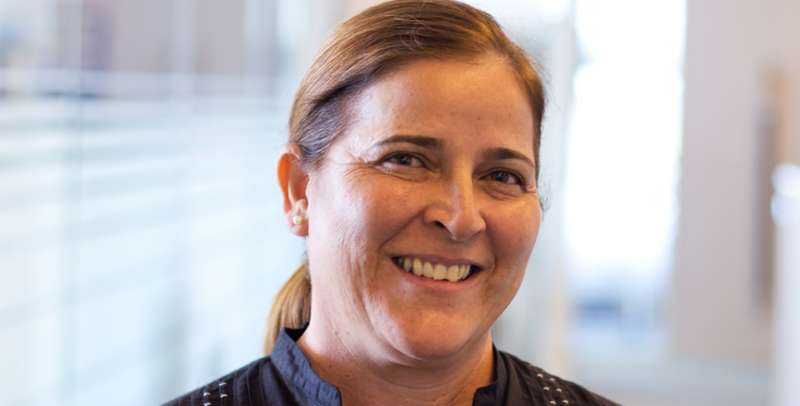 “Today, Governor Doug Ducey proposed a budget that includes a $6 million investment in healthcare training programs for the Maricopa Community Colleges,” said Maria Harper-Marinick, chancellor of Maricopa Community Colleges. 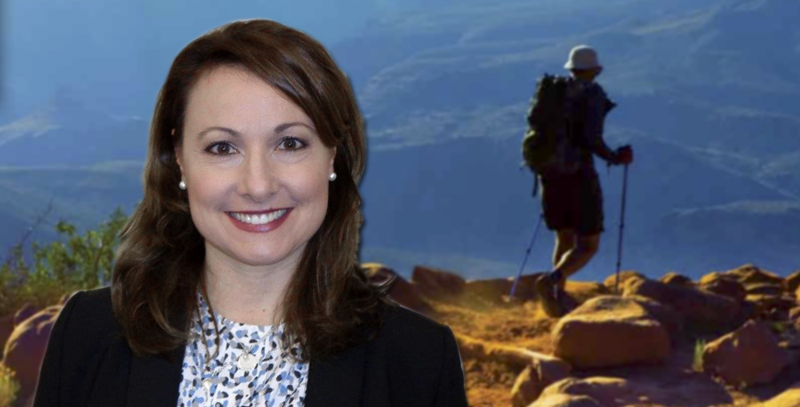 “We look forward to the continued collaboration with industry and state leaders to strengthen Arizona’s economy by preparing students for a successful place in the workforce of today and tomorrow,” Harper-Marinick said. 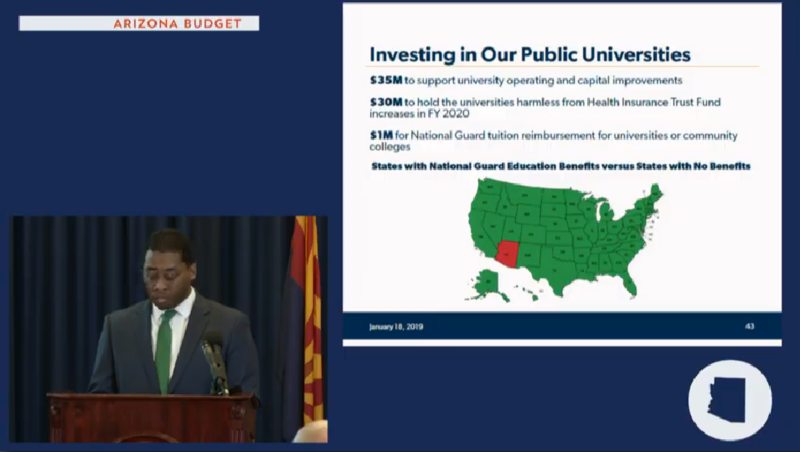 The Governor’s proposal also includes $35 million to support universities operations and maintenance costs associated with Arizona students, Pasley said. While the state previously provided educational benefits to Arizona National Guard members, these benefits were halted due to the Great Recession in 2011, Pasley said. “Currently, Arizona is the only state in the nation that does not offer any form of tuition assistance to members of it’s National Guard,” Pasley said. Continuing education is critical to advancement and promotion in all branches of the armed services, with this in mind, the executive budget includes $1 million for a National Guard tuition reimbursement program, Pasley said.